A fan works very simply. First the appliance cord is plugged into an electrical socket, or it has a battery for its source of energy. The electricity flows from the socket to the fan through wires. 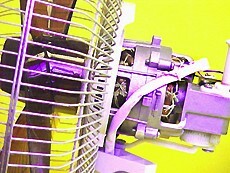 The electricity gives energy to the motor in the fan and starts it up. 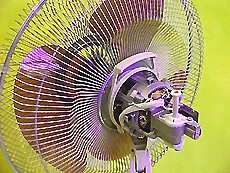 The blades on the fan begin to spin, and then there are controls that control the speed at which the blades will spin. 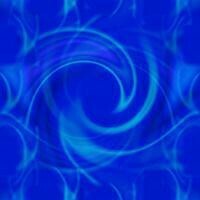 The blades move or circulate the air. The fan itself actually gives off heat from the motor. An oscillating fan has a gear system that allows the fan to move back and forth to move the air over a larger space.